Nissan is creating capacity to build 250,000 Leafs a year in the U.S., Europe and Japan. 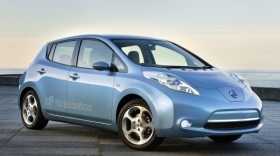 TOKYO – The Nissan Leaf is on its way. Production of the electric vehicle has started at Nissan Motor Co.'s Oppama plant south of Tokyo, and exports to the United States will begin next month. Shipments to Europe will follow in December, the carmaker said in a statement. “This is a significant milestone, not only for Nissan and the Renault-Nissan Alliance, but also for the entire automotive industry,” Nissan CEO Carlos Ghosn said at an offline ceremony. Nissan will begin manufacturing the Leaf at Oppama while it builds additional assembly lines and battery plants for the car in the United States and the UK. When the car goes on sale in the United States in December, initial supply of the model will come from Japan. The Oppama plant has an annual production capacity of 50,000 units. Production at Nissan's Smyrna, Tenn., plant begins in late 2012 and at Sunderland, England, in early 2013. Smyrna will have an annual capacity of 150,000 units, Sunderland of 50,000 units. Nissan is investing $1.8 billion on the vehicle in the United States alone, using a $1.4 billion low-interest loan from the U.S. Department of Energy to create assembly capacity at Smyrna. The Leaf's lithium ion battery packs will initially be manufactured near Oppama in Zama, Japan, by Automotive Energy Supply Corp., a joint-venture between Nissan and NEC Corp. But Nissan also plans to make the batteries in the United States and Europe.